Are you searching for the “ultimate” sliding compound miter saw?A miter saw where virtually all of the little features, tweaks, and design elements that enhance the user experience have been taken into consideration, and price is no object? 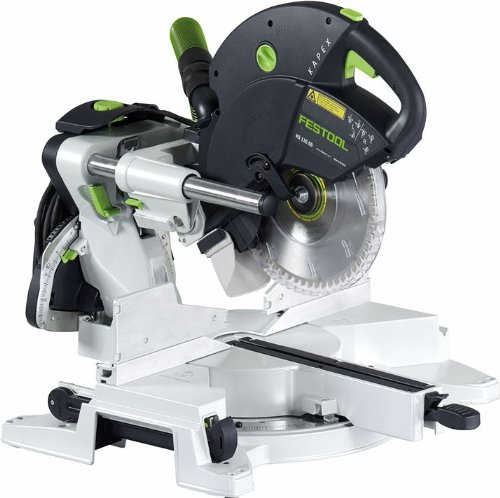 You’re destination is the Festool Kapex KS 120 Sliding Compound Miter Saw. It was developed with the single minded goal of being the best sliding compound miter saw. Period. Game over. 3 What Are The Cons? The KS 120′s rail forward design with stationary rails and a sliding head creates a small footprint and allows the the Kapex to be placed up against a wall, in addition to facilitating storage and transport. Stability is achieved through two large 1-3/16″ (30mm) diameter widely spaced rails, minimizing saw head play/deflection. The durable magnesium-alloy honeycomb design base of the Kapex is extremely rigid while remaining very lightweight (47 lbs.) compared to other 10″ miter saws. An ergonomically designed carrying position, combining two handle locations with the ability to lock the saw head into a compact stationary position, keeps the KS 120′s center of gravity close to your body, minimizing back strain and making it easy to move around the work site. Festool’s unique MMC (Multiple Material Control) Electronics provides not just constant blade speed under load, but also variable speed control, which you can dial in just above the trigger, using the quick reference chart on the side of the head to select the appropriate speed based on your application. Constant blade speed combined with the right overall speed for your material delivers cleaner, more accurate cuts. MMC Electronics also provide soft start and magnetic brake features, as well as thermal/overload protection for the 1,600 Watt, 13 AMP Direct Drive Motor. The variable speed feature is mainly useful for materials other than wood. Dual lasers are on many people’s miter saw wish list, and the Kapex really delivers, adding three-axis adjustment controls to allow you to fine tune the lasers, a convenient button to turn them on without powering up the saw, and wiring them into the saw’s electrical, requiring no batteries. The etched stainless steel miter scale is large, easy to read, and positioned far from the axis of rotation, which makes setting up those fine fraction-of-a-degree cuts precise and easy. The miter scale has a range of 50 degrees to the left and 60 degrees to the right, with detents at common angles. The bevel scale is also large, easy to read, and located far from the rotational axis to maximize accuracy. A counter balance spring mechanism keeps the head in place during alignment even while the bevel is unlocked making angle adjustment more accurate, while the bevel micro-adjustment knob dials in accurate angles to a fraction of a degree. A MiterFast Angle Transfer Device is included with the KS 120, and makes transferring inside and outside angles from the workpiece to your saw fast and easy, letting you avoid complex angle calculations. A secure locking mechanism prevents slipping. The reflective surface of the MiterFast works together with the saw’s dual lasers for easy angle transfers. Users found the MiterFast to be especially useful in renovations when dealing with existing walls that were out of square. Contributing to the Kapex’s accuracy are the sturdy 1-3/16″(30mm) diameter, widely spaced slide rails, and the large 1-3/16″(30mm) arbor for reduced blade wobble and deflection. The Kapex’s vertical, center-positioned handle works equally well with either hand, and keeps feed pressure directly in line with the blade to minimize head deflection. A two stage trigger allows the head to move and the blade guard to be raised at the first stage and triggers power at the second stage when the safety button is also depressed. The Kapex miter lock is engaged and released by flipping the end of the miter handle up or down, providing a very secure hold to prevent unintentional slippage even when close to a detent, giving you confidence that the angle selected is exact. The large bevel lock knob is conveniently located on top of the KS 120, and provides three settings: positive detent at 0 and swings 45 degrees left, free movement between -45 & +45 degrees, and free movement between -47 & +47 degrees. Bevel can be set left and right with bevel scales on both sides. The bevel fine-adjustment knob is on the end of the right rail, employing rack and pinion precision to allow you to dial in bevel angles to fractions of a degree. The counter spring balanced head will stay in place during adjustments even before you lock it down. The Kapex miter saw’s 91 percent dust collection ability starts with the clear, narrow blade guard which is designed to improve dust extraction efficiency and provide excellent visibility. The pliable rubber dust hood then directs chips directly into the extraction port, which features a swivel design for convenient positioning of the dust extraction hose. Although the extraction port accepts both 27mm and 36mm hoses, the 91 percent dust collection rate is achieved only when using the 36mm hose and a Festool CT 22 or Ct 33 Dust Extractor. Owner reviews indicated that there is a significant increase in dust collection when using the 36mm hose. One owner’s close observation of Festool training materials led to the conclusion that a shorter hose between the saw and Extractor also increases collection efficiency. 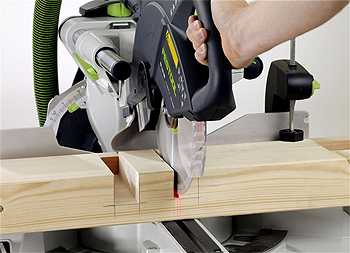 Festool Kapex blades are designed to create a thin kerf, reducing motor load and improving cut quality, as well as dampening vibration and reducing noise levels. User reviews indicate that the Kapex really is noticeably quieter than other sliders they had used. The large 1-3/16″ (30mm) arbor hole means the blade is supported farther out from it center, reducing blade deflection. Changing blades is quick and easy with Festool’s patented FastFix blade changing system, where turning the FastFix knob locks the arbor and mechanically locks the trigger, allowing single handed blade changes. To prevent damage to the saw and blade a cupped steel arbor nut prevents accidental over torquing. The arbor tool is stored on-board for easy access. The Kapex KS 120 features a special cutting position that can be locked in with the flip of a lever when needed to provide greater than usual vertical capacity by more effective use of the back part of the blade. Cut nested crown molding up to 6-5/8″ and material vertically up to 4-3/4″ x 3/4″. Owners commented that the Kapex was like a 10″ saw with nearly the capacity of a 12″. The Kapex also provides a unique, accurate trenching / dado capability. Flip a conveniently located knob to lock the head in place, then turn the knob to adjust the depth of the cut. The KS 120 provides on-board cord & tool storage which keeps the cord under control, preventing damage and tripping accidents, while the arbor tool is kept handy for blade changes. Even the MiterFast angle finder has its own cubbyhole in the base. Overall, the storage features create a neater package for transport and storage. Included with the Kapex is a keyed, non-slip clamp designed for quick, easy application and removal. Employing a single lever-actuated cam-lock to secure the clamp in position, the head will not slide down and interfere with the positioning of your stock when the lock is disengaged. The oblong, rubber padded foot is shaped with a flat surface that can be aligned right up against the fence. Even the deck height of Festool’s Kapex was taken into consideration, designed to match the height of their Systainer 1 storage system, allowing the saw to be used on the floor or deck while the Systainers support long workpieces. Additionally, the height difference between the MFT/3 and MFT/3-Kapex multifunction tables has the MFT/3-Kapex shorter, so the MFT/3 matches the deck height of the saw and can be used outboard to support long stock,. So what do users have to say about the Kapex KS 120? Festool P00107 Kapex Cutting Extensions 2-Piece Set – One side expansion range of 60-3/4″ – 91″, with total extension accommodating pieces 16 feet long. Adjustable flip stop travels entire length, even when fully extended. Crown support for tall materials to 5-5/8″.Legs can be removed for compact transport and storage. Festool 491594 Quick Clamp – Works seamlessly with the Festool MFT/3 (MultiFunction Table), employing a racheting mechanism for fast locking and quick release. Festool 489571 Screw Clamps 11-13/16 inch (2 pack) – Long versatile clamps that will also work well with the Festool MFT (MultiFunction Table). Festool 489570 Clamps (2 pack) – The shorter 4-11/16 version of the 489571 above. Festool 494369 Crown Stop With Base Extension – Fits either side of the Kapex to secure crown molding in the nested position. Attaches easily using a v-groove channel, and the crown stops are locked down with a T-nut for quick setups. Festool 494391 Hold Down Clamp – Cam fast-action design replacement clamp for securing workpieces to the deck of the Kapex. 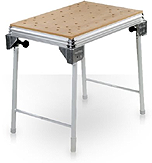 Festool 495565 MFT/3-Kapex Multifunction Table – Designed specifically for use with the Kapex KS 120, it features folding legs, slip resistant feet, and works with Festool clamps and clamping accessories. The MFT/3-Kapex stand has a 20-11/16″ x 32-1/16″ grid-hole workspace with many attachment points, and weighs 42lbs. You would think that a saw this expensive and well designed would have no real issues, but of course that’s not the case, and one of the biggest issues is price itself. Some owners feel it is grossly overpriced for the value received, others feel it’s well worth every dollar spent. Obviously, most owners feel it to be worth the money or they wouldn’t have purchased, so it’s a biased set of opinions. Hopefully, you find enough useful information here to make the right decision for yourself, whatever that may be. Another sore point is the manual – there is an original and supplemental – that many users feel could be much better. First time miter saw buyers are not likely to buy this saw, but with the numerous features to figure out, a better manual would help even pros get up to speed quicker. Some users felt the limited selection of the non-standard 10-1/4″(260mm) blades and 1-3/16″(30mm) arbor hole, as well as the premium price of Festool’s blades was a drawback. However, many felt the Festool blades and those from other manufacturers provided sufficient selection, excellent results, and were worth the premium price. Although more manufacturers are making blades in this size (Forrest has a new 260mm x 90 tooth CHOPMASTER available), you can’t expect to just select one in any configuration from your favorite manufacturer. Working the two position safety trigger and the safety button takes some getting used to for many people. Not a deal breaker, but not the normally expected operation either. Users generally agreed that the 36mm dust collection hose works far better than the 27mm, but some balked at the (approx.) $135 price for the larger diameter hose. When cutting more extreme bevels(30+ degrees), the rails contact the fence, which needs to be moved out of the way or removed completely. The Allen wrench required to remove the retaining screw that keeps the fence from coming off (not the latch that allows the fence to slide) does not have an on-board storage spot.